When I was first made aware of a new solar filter material that was a flexible sheet that was safe for viewing the sun, I got a piece, mounted it in card stock, and then checked with my eye doctor who was skeptical about the safety factor of the material, and he took the best sun glasses they carried and used a machine to pass light that appeared to have the intensity of a carbon arc through the lens, and a computer print-out gave information about the blockage results that would show the leak percentage of any harmful rays. The results were minimal. He then tested my Baader filter material. He was surprised. No harmful rays were recorded. He performed a second run just to make sure that the first was accurate. It was. He approved using the Baader Solar Filter Material for solar observation. I let him keep the pre-mounted filter. I got a larger section of material as a trial run by having the local astronomy club make solar filters for their telescopes and binoculars or camera telephoto lenses. 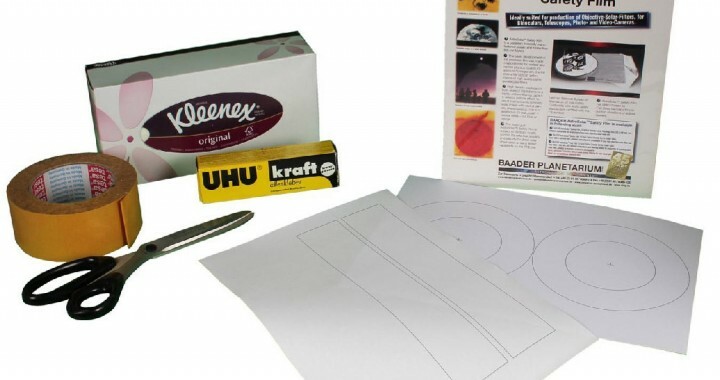 Since the material could be cut with scissors or a sharp box knife with a guide edge over a sheet of cardboard, it was mounted between squares of card stock with a circle cut out for the viewing area. The material was larger than the diameter of the hole in the card stock to avoid any possibility of light leak. Members fit the filters to their various pieces of equipment. Following that session, there was a lot of observation and photography done on sunspots, and the club members were quite happy with the results. I asked Astro-Physics if I could sell filters that I might make with the filter material. I was told that it was permissible, so I invested in rolls of material, and formed a small business to sell solar filter material and other astronomical supplies for avid amateur astronomers, teachers, and students who could use the materials as part of a Science Fair project or for personal viewing. It was mounted in card stock to fit various telescopes and binoculars, or to use for simply viewing the sun through the mounted filter. With proper care, these filters can last a long time, and if the mount is damaged by moisture, the filter can easily be re-mounted. Jerry Co. Surplus Catalogue had copier lenses, and wondering if they could be used to make a telescope, they were purchased along with lenses that might be used as eyepieces, and the Copier Lens ‘Scope was born. Jerry Co. Surplus put up an info box in their catalogue describing the new telescope, and they sold both the main objective and lenses that were suitable for eyepieces. They made a nice, easily transportable telescope that gave a very good view, and when provided with a Baader Solar Filter, they afforded many the security of being able to view solar events affordably. Many teachers must pay out of pocket for extra school supplies. Seminars for educators were held, and participants made their own Copier Lens Telescopes with help on hand, and were provided with eyepieces and Baader Solar Filter Material to make a filter cap for their telescopes. This helped give teachers a resource that they ordinarily would not have been able to afford through the school budget. Astronomy can be affordable. The flexibility and ease of cutting Baader Solar Filter Material allows it to be configured for various sizes of instruments or viewing cards. This allows more people to be able to enjoy solar observation as part of astronomical viewing, and to be able to safely participate in solar photography for events such as eclipses, or the Venus transit, or sunspot tracking. 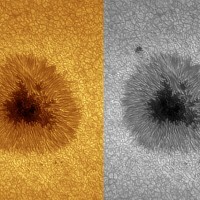 With a good instrument, granulation on the surface of the sun can be photographed, as well as the sunspots. Viewers have been supplied to astronomy clubs in the United States and abroad, to military stationed overseas, the Department of Education, a prison, and to various individuals and school groups in the United States and abroad. The easy distribution of this lightweight material offers opportunities for observation to a wide range of people who are interested in various aspects of solar observation, and the cost is affordable to those on a limited budget. 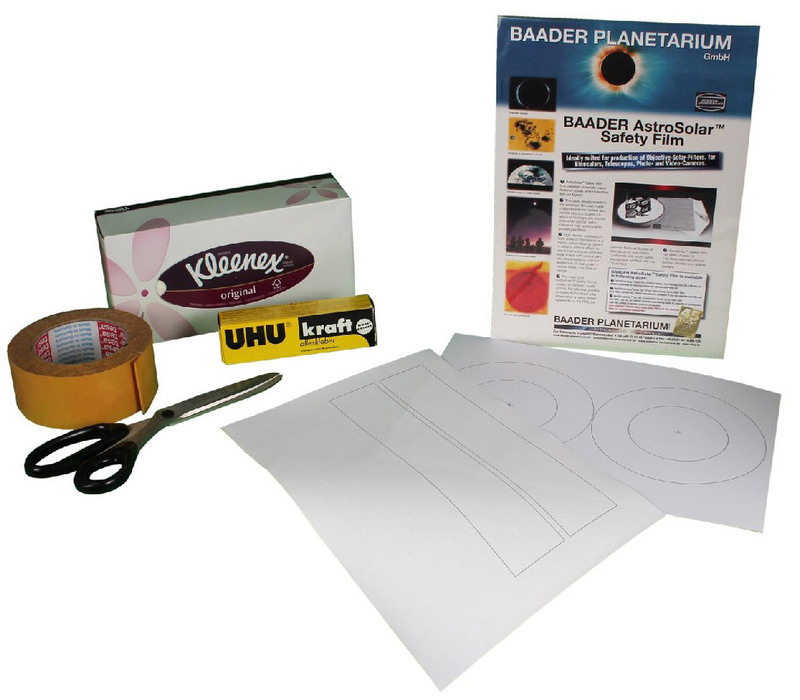 One of the most important things to know, besides the safety of this material if properly mounted, is that Baader Solar Filter Material can open up a new view of our part of the Solar System for those who cannot afford expensive equipment…as well as for those who can.